Why Bill Nye’s show won’t save the world. His show likely won’t even reach the people it aims to influence. 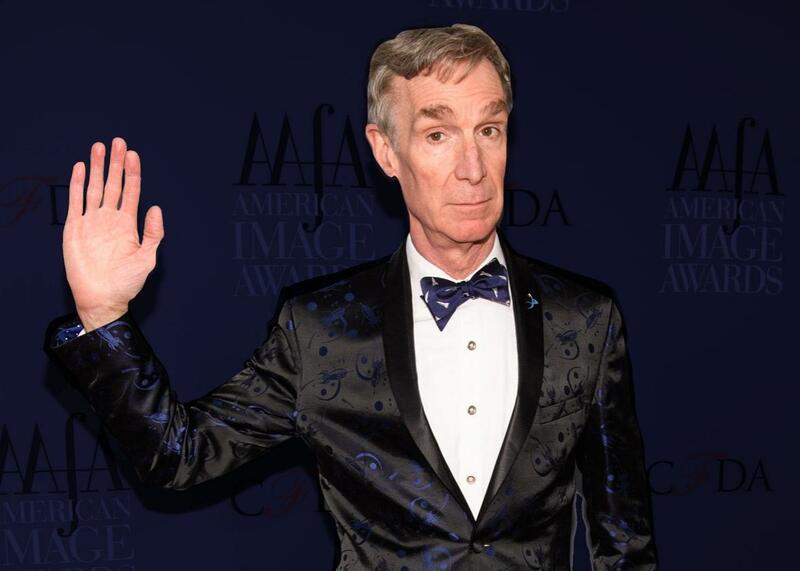 Bill Nye arrives at the 39th Annual American Image Awards on Monday in New York City. Photo illustration by Slate. Photo by Dave Kotinsky/Getty Images. Netflix’s new talk show, Bill Nye Saves the World, debuted the night before people around the world joined together to demonstrate and March for Science. Many have lauded the timing and relevance of the show, featuring the famous “Science Guy” as its host, because it aims to myth-bust and debunk anti-scientific claims in an alternative-fact era. But what deserves to be successful isn’t always what ends up winning hearts and minds in the real world. In fact, empirical data we collected suggest that the viewership of such shows—even heavily publicized and celebrity-endorsed ones—is small and made up of people who are already highly educated, knowledgeable about science and receptive to scientific evidence. However, Tyson’s efforts to reach a broad audience and preach beyond the proverbial choir fell short. Nielsen ratings indicate the new version of Cosmos reached 1.3 percent of television households, which doesn’t compare well even to other science shows and educational programming. PBS’ NOVA, for instance, typically reaches about 3 percent of households (around 4 million viewers a week), and PBS’ other prime-time programming usually gets higher Nielsen ratings than Cosmos had. Cosmos lagged even further behind science entertainment shows like NCIS, which reached 11.2 percent of households, and The Big Bang Theory, which reached 10.8 percent of households during the same week Cosmos aired its first episode. In 2014, we conducted a representative national survey in a collaboration among the University of Wisconsin, the University of Pennsylvania’s Annenberg Public Policy Center and Temple University. We found that 76.1 percent of Americans did not watch any episodes of Cosmos, 7.1 percent said they watched one episode, and only 2.4 percent said they watched all 13 episodes. And there were really no surprises about who tuned in. Respondents who saw at least one episode were 40 percent more likely to be male, 35 percent more likely to claim interest in science, and significantly more knowledgeable about science than those who didn’t watch. Less-affluent audiences were less likely to watch at least one episode, as were those who were highly religious. Even those who expressed above-average interest in science watched only 1.5 Cosmos episodes on average. Engaging scientific programming could still be an antidote to waning public interest in science, especially where formal science education is falling short. But it is revealing that Cosmos—a heavily marketed, big-budget show backed by Fox Networks and Family Guy creator Seth McFarlane—did not reach the audience who needs quality science information the most. Bill Nye Saves the World might not either. Its streaming numbers are not yet available. Today’s fragmented and partisan media environment fosters selective exposure and motivated reasoning—that is, viewers typically tune in to programming that confirms their existing worldview. There are few opportunities or incentives for audiences to engage with scientific evidence in the media. All of this can propagate misleading claims and deter audiences from accepting the conclusions of sound science. And adoption of misinformation and alternative facts is not a partisan problem. Policy debates questioning or ignoring scientific consensus on vaccines, climate change and GMOs have cut across different political camps. None of this is meant to downplay the huge potential of entertainment media to reach diverse audiences beyond the proverbial choir. We know from decades of research that our mental images of science and its impact on society are shaped heavily by (sometimes stereotypical) portrayals of science and scientists in shows like The Big Bang Theory or Orphan Black. While Cosmos failed to attract a diverse audience eager to be introduced to the wonders of the universe (and science), there’s still value in the science community and entertainment industry collaboratively developing these kinds of television programs. In order to be successful, however, these collaborations must draw on insights from social science research to maximize the reach of novel diverse formats, communication strategies, and media outlets. The National Academies of Sciences, Engineerin,g and Medicine’s Science and Entertainment Exchange, for instance, tries to connect the entertainment industry and the nation’s best scientists in order to combine the reach of entertainment media’s engaging storytelling with the most accurate portrayal of science. And social science research suggests that complex information can reach audiences via the most unlikely of places, including the satirical fake news program The Colbert Report. In fact, a University of Pennsylvania study showed that a series of Colbert Report episodes about Super PACs and 501(c)(4) groups during the 2012 presidential election did a better job educating viewers than did mainstream programming in traditional news formats.